Which neighbourhoods in America offer children the best chances of climbing the income ladder? To answer this question, we construct the Opportunity Atlas, a freely available interactive mapping tool that traces the roots of outcomes such as poverty and incarceration back to the neighbourhoods in which children grew up. Using the Atlas, you can see exactly where and for whom opportunity is lacking in your community and develop customised solutions to improve children’s outcomes. The Opportunity Atlas is built using anonymised data on 20 million Americans who are in their mid-30s today. We map these individuals back to the Census tract (geographic units consisting of about 4,200 people) in which they grew up. Then, for each of the 70,000 tracts in America, we estimate children’s average earnings, incarceration rates, and other outcomes by their parental income level, race, and gender. The new data yield several insights into how neighbourhoods shape children’s trajectories (Chetty et al. 2018). Children who grow up a few miles apart in families with comparable incomes have very different life outcomes. To take one example, the map above shows incarceration rates for black men who grew up in very low-income families in central Los Angeles. Forty-four percent of black men who grew up in Watts were incarcerated on 1 April 2010, the day of the 2010 Census. 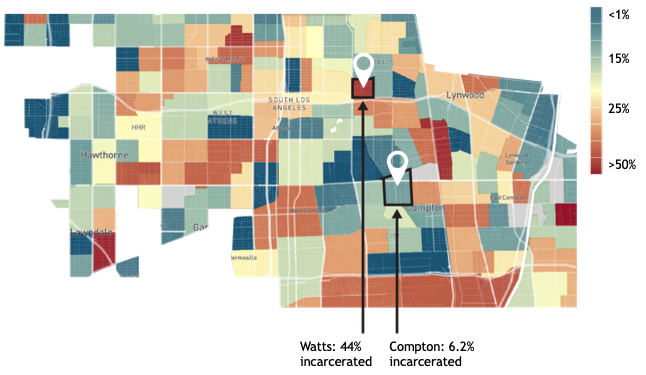 By contrast, 6.2% of black men who grow up in families with similar incomes in central Compton, 2.3 miles south of Watts, were incarcerated on that day. We find similar variation in a spectrum of other outcomes – from earnings to teenage birth rates – across nearby neighbourhoods, not just in Los Angeles but in most cities in America. In rural areas too, neighbouring towns often exhibit sharply different outcomes for local children. Many think of neighbourhoods as either ‘good’ or ‘bad’ for everyone. But, we find that outcomes can differ sharply across people who grow up in the same neighbourhoods. Returning to the example above, Hispanic men who grew up in Watts have an incarceration rate of 4% – an order of magnitude smaller than for black men raised in the same tract. Outcomes also differ by gender: in Watts, low-income black women grow up to earn three times as much as low-income black men. These differences show that we should not think of neighbourhood quality – or the policies that might improve it – as ‘one size fits all’. It may be more impactful to design policies that target specific sub- groups in ways that directly address the particular challenges they face. Children who move to high-upward-mobility neighbourhoods earlier in their childhood earn more as adults, as illustrated in Figure 2. This chart shows the average income (at age 35) of children raised in low- income families who move from the Central District of Seattle, a low-upward mobility area, to Shoreline, a high upward-mobility area that is ten miles north. 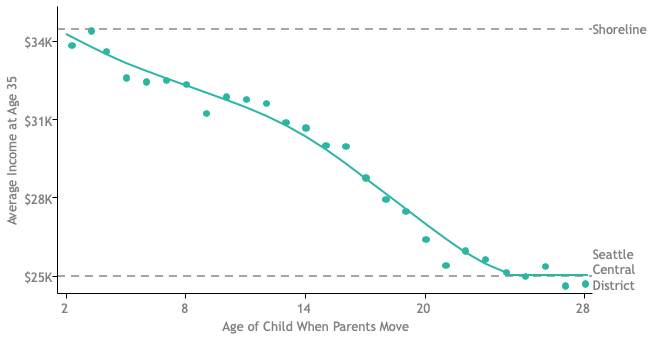 Children who make this move at birth earn $9,000 more per year than those who move in their 20s. Furthermore, revisiting data from the Moving to Opportunity Experiment, we find that children whose families who were randomly offered a voucher to move to a neighbourhood that had higher rates of upward mobility according to the Atlas indeed earned more in adulthood. On average, moving within one’s metro area from a below-average to an above-average neighbourhood in terms of upward mobility would increase the lifetime earnings of a child growing up in a low-income family by $200,000. Children who grow up in better areas are also less likely to be incarcerated and are less likely to have teen births. The lesson from these findings is not necessarily that moving is the best solution to increasing upward mobility, but rather that the low rates of upward mobility observed in some areas can be changed. By studying the places that produce the best outcomes for low-income children, one may be able to replicate those successes in other areas through place-focused investments. Our new measures of upward mobility differ from traditional indicators of the health of a local economy, such as job growth. Figure 3 shows that there is no association between low-income children's earnings in adulthood and job growth rates across cities. For example, Atlanta and Charlotte have had very high rates of job and wage growth over the past two decades, yet they have among the lowest rates of upward mobility for children who grow up there. 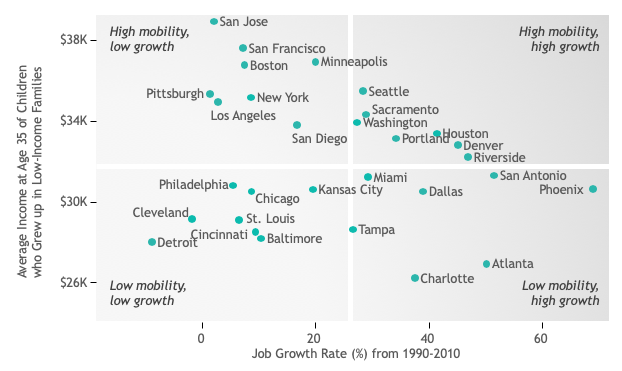 These cities achieve high rates of economic growth by importing talent – i.e. by attracting high-skilled people to move in and fill high-paying jobs. While this impressive economic growth may have brought other benefits to these cities, it is clear that a booming economy does not guarantee better outcomes for local children. In contrast, we find a strong positive correlation between the employment rates of adults who live in a given tract and rates of upward mobility for children who grow up there. Evidently, what matters for upward mobility is not proximity to jobs, but growing up around people who have jobs. Upward mobility rates for children also correlate strongly with other characteristics of the local population, such as mean incomes, the share of two-parent families, as well as proxies for social capital and test scores. For all of these characteristics, what matters are conditions in one's own immediate neighbourhood rather than in nearby areas, even those just one mile away. For example, poverty rates in neighbouring tracts are essentially unrelated to a child’s outcomes, controlling for poverty rates where he or she lives. Our measures of economic opportunity differ from existing neighbourhood-level measures of opportunity because we directly study children's actual outcomes, rather than proxies such as poverty rates, homeownership rates, or test scores. By directly studying out- comes, we avoid difficult-to-test assumptions about which proxies best predict children’s outcomes. The drawback of our outcome-based measures is that they come with a lag, because one must wait until children grow up to see their earnings. However, we find that places that produced good outcomes in the past typically tend to produce good outcomes a decade later. Moreover, historical outcome data prove to be much better predictors of outcomes than more recent data on poverty rates or test scores. Our estimates are thus highly informative predictors of economic opportunity even for children today, although they should be combined with additional analyses and on-the-ground knowledge in areas that have changed substantially. On average, higher-opportunity neighbourhoods have higher costs of living, but there are many areas that appear to be ‘opportunity bargains’ – places that produce good outcomes for children without high rents. The table below lists such neighbourhoods in the ten largest metro areas in the US. The availability of low-rent, high opportunity neighbourhoods suggests that affordable housing policies could be redesigned to produce larger gains for children without increasing government expenditure. More broadly, the existence of opportunity bargain areas shows that creating pathways to opportunity need not require reproducing conditions in highly affluent, expensive neighbourhoods. Going forward, researchers can use the Opportunity Atlas to reveal new insights into the mechanisms that drive upward mobility by comparing areas that have similar characteristics but produce different outcomes for children. Policymakers and practitioners can use the Atlas to better target programmes that aim to improve economic opportunities for disadvantaged children. For example, the placement of pre-school programmes or eligibility for local programmes or tax credits could be informed by these data. As another example, housing authorities in the Seattle metropolitan area are currently conducting a pilot study that provides information and assistance to housing voucher recipients to move to high-opportunity areas. We view the development and evaluation of such efforts as a valuable path forward to improving economic mobility across the country. Authors’ note: Any opinions and conclusions expressed herein are those of the authors and do not necessarily reflect the views of the U.S. Census Bureau. All results have been reviewed to ensure that no confidential information is disclosed. The statistical summaries reported in this column have been cleared by the Census Bureau's Disclosure Review Board release authorisation number CBDRB-FY18-319. Chetty, R, J N Friedman, N Hendren, M R Jones and S R Porter (2018), “The Opportunity Atlas: Mapping the Childhood Roots of Social Mobility”, NBER Working Paper No. 25147.